Coupon Description: MoreBeer.com currently has a coupon code for a Keg and Carboy Washer. Mark’s Mark II Keg Washer is designed to clean and sanitize home brewing vessels like kegs and carboys. It is also intended to provide a sanitation container for miscellaneous items such as airlocks, thermometers, tubing, keg fittings, and more. Coupon Description: MoreBeer.com currently has a coupon code where when you spend $150 or more, you save $25. This MoreBeer promo code is for today only! Coupon Description: MoreBeer.com is currently has a coupon code that get you a homebrewing electric water heating element for just $53.99. This stainless steel homebrewing water heating element allows you to preheat your mash before beginning the brewing process. This handy little tool works in conjunction with a product like the Ranco or Johnson temperature controller by enabling you to set an exact hot liquid temperature on the controller, and then attaching it to the homebrewing water heater. The temperature controller will turn off the stainless steel home brewing water heater once it reaches your desired temperature. Coupon Description: Right now there is a deal on Amazon where for $11.55 you can get one of the best home beer brewing books available. How to Brew by John Palmer teaches you everything needed to brew beer right the first time. Palmer presents homebrewing in a simple yet comprehensive style without frivolous interruptions. I can not recommend this homebrewing book highly enough and right now it is available at an incredible price! Coupon Description: MoreBeer.com is currently has a sale going on where you can pick up select hop rhizomes for $4.25! Grow your own hops with one of these more beer hop rhizomes! With one of these hop rhizomes you can grow your own hops and use them to fresh hop or dry hop your homebrew! Compressor delay protection for refrigeration control. You can set the value as your requirement. Coupon Description: I have compiled a list of some of the best prices I could find on homebrewing quick connects and homebrewing quick disconnects. Stainless steel quick disconnects will dramatically improve your brew day by making your connections extremely quick and convenient. With conventional threaded fittings, moving around your tubing can be time consuming, troublesome, and even dangerous when working with hot liquids. Quick disconnects allow you to quickly and easily move your tubing; all with a single hand! They save time and decrease ware! I highly recommend them as an addition to your home brewery. Here are some of the best deals that I have been able to find on home brewing quick connects and homebrewing quick disconnects. 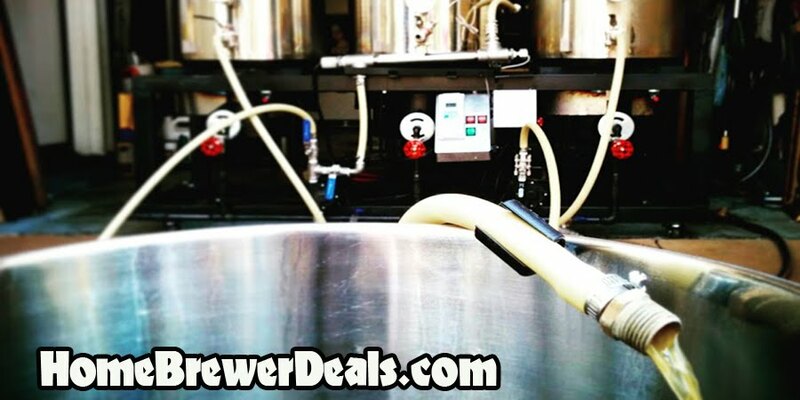 Coupon Description: MoreBeer.com is currently has a sale going on Blichmann home brewing equipment that can save you up to 20% on homebrewing kettles and stainless steel conical fermenters. I am not too sure how long this MoreBeer.com Promo Code will last, so save while you can! Coupon Description: MoreBeer.com is currently has a coupon for PBW Homebrewing Cleaner. You can pick up a 8 LBS container for $39.99, it usually goes for $49.99. PBW or Powder Brewery Wash is a safe alkaline cleaner for everything around your brewhouse. It’s a favorite of small home breweries because it out-performs caustic chemicals without scrubbing. Just put your kettle, bottles, carboy, etc. in for a good long soak.